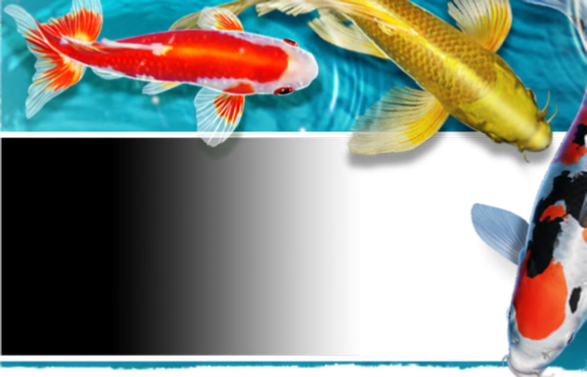 Like all fresh water environments, Koi and Goldfish ponds are living ecosystems. They contain plants, algae, invertebrates, protozoa, bacteria and molds or fungi. Many of the life forms in our ponds are dependent upon each other. This is known as symbiosis (living together). An extreme form of symbiosis is parasitism, where one life form lives at the expense of another. One of the more common forms of parasitism in our ponds is Saprolegnia or water fungus. 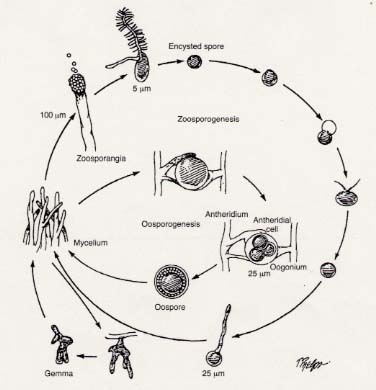 For the average ponder, great zoological detail about Saprolegnia is not required to understand what it is, what it does and how to treat the pond and fish if it becomes a problem, therefore not much detail on the zoology of Saprolegnia is offered here: just good-to-know information on how to identify and treat it as well as some tips to help prevent it from affecting your fish. What It Is: Saprolegnia (or sap) is a freshwater fungus which simply means it lives in fresh water environments and needs water to grow and reproduce. Sap can also be found in brackish water and moist soil. It is often referred to as a “cold water” fungus as it flourishes in colder water, but it lives well in a wide range of water temperatures extending from 37 deg F to 91 deg F (3 to 31 deg C). While it has been described also as a “mold”, sap is a genus of fungus, with the difference being a “mold” is a mass of fungi. Under the microscope, sap is composed of filaments that tend to have spherical ends. It is these spherical ends that house the zoospores, or the “seeds” of sap, that allow it to proliferate and spread. 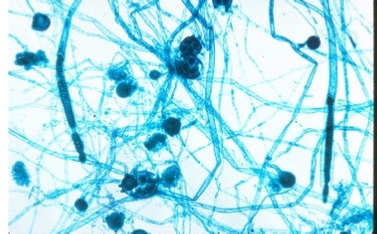 The filaments are called hyphae and give sap its cotton-like appearance. It is the hyphae, or more exactly, the hooked, foot-end of the hyphae, which penetrate the tissue of the fish as they seek nutrients. In the lower-power micrograph below, you can see the hyphae with the spherical ends. With a 400x microscope, the structure will look basically the same. In the water, sap looks like fluffy cotton; however, out of the water it appears to be a matted mess of slime. Sap starts out either white or grey in color. The grey appearance also may indicate the presence of bacteria growing with sap’s structure. Over a short period of time, sap may turn brown or green as organic particles in the water (such as algae) adhere to the filaments. Note the picture on the right. This is a classic presentation of sap that has invaded a bacterial infection of the dorsal fin area of a Koi. The green color is actually embedded algae particles within the sap’s filaments. 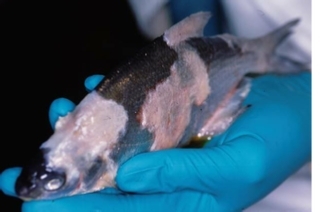 By appearance, sap can be easily confused with Epistylus, a freshwater parasite that presents as a white cottony substance growing on the skin of the fish. Epistylus does not gather organic particles and will remain white. Confirmation of Epistylus versus sap should be done with a microscope. The favorite food of sap is dead organic tissue. We can usually see evidence of sap on dead and dying fish, live and dead fish eggs and even food left in the water so long that it has begun to rot. Typically we see infertile Koi eggs being infected first with the fungus then it spreads to kill live, fertile eggs. Infected eggs have a typical fluffy cotton wool-like covering. Sap also likes to feast on exposed and decaying tissue caused by bacterial infections, such as ulcers. It is most prevalent on the head and fins of the fish as these are the areas that offer the least amount of natural resistance provided by the mucous coat. Primary and Secondary Invader: Typically we think of sap as a “secondary” invader. This means that something else has violated the integrity of the fish’s skin allowing bacteria to enter and provide direct tissue access for the sap hyphae to embed themselves. In treating sap, it is imperative to treat BOTH the sap and the underlying primary cause. This will be discussed in more detail in the treatment section below. Water temperature changes – stress. Obviously the underlying theme in the above list is “stress” and this is the one thing that we need to guard against first and foremost to keep our fish healthy. In healthy conditions, our fish have some natural protection against sap with the mucous layer being the most effective first line of defense. The mucous layer provides the ability to reject a sap attack by sloughing off a layer of mucous and sending the sap with it. The mucous coat also provides a natural fungicide at the cell-level. So you can see that improper handling or any activity that reduces the mucous coat offers an increased opportunity for sap to take hold. We know that sap attacks fish weakened by any of the above and the suppressed nature of the immune system under cold water or high stress conditions leaves the fish mostly defenseless. However, what kills the fish in a sap attack is a condition known as hemodilution. By definition, hemodilution is “a decreased concentration (as after hemorrhage) of cells and solids in the blood resulting from gain of fluid from the tissues.”, this causes the blood to loose electrolytes (blood salts) and make it less than life-supporting. Then as the sap hyphae penetrate the tissue layers of the skin, water begins to enter the fish thereby further diluting the fish’s blood salts. This explains why fish grossly affected by sap appear lethargic and often lose their equilibrium. Once it has (literally!) taken root, sap can spread rapidly over the surface tissue of the fish. While it is rare that sap will penetrate deep into tissue layers, even superficial damage to the fish’s initial tissue layers (and particularly the gills) can be deadly. Obviously, the more wide-spread the sap infection becomes, the higher the rate of hemodilution and greater chance that the fish will not recover. Therefore, managing the sap infection quickly becomes the key to saving the fish. Malachite Green (MG): Hands down, this is the best treatment for all fungal problems, including sap. MG baths and dips work_ exceptionally well and one treatment will usually solve the problem (assuming any contributing causes are corrected as well). There are certain cautions that go with using MG, such as use only in cooler, well aerated water, so read the label carefully for instructions and precautions. MG is not recommended as a pond-wide treatment for sap as the concentration levels needed to kill off sap are too high for a pond-wide treatment to be effective. Salt: This is a distant “second best” treatment to MG. Salt in the 0.6 to 1.0% range for 30 minutes or less can help eliminate sap. The caution with this approach is that the higher the salt level, the more stress the fish will endure so check carefully on the stability of your fish prior to performing a high-level salt bath. Formalin: Formalin is mentioned as a treatment for sap however, generally speaking, formalin is ineffective against most molds and fungi. Like MG and salt, formalin comes with its own precautions, including limiting its use in warm water, where low oxygen situations may develop. Handle formalin with care, its toxicity is well known. Diluted versions of formalin products offer a nice one-two punch where MG takes out the sap and formalin gets the parasites. It is not recommended to use formalin against open wounds because of the harmful effect of formalin on exposed tissue and cell structures. Potassium Permanganate: In the right hands, PP is one of the better treatments for sap. PP treatments at 4PPM (4g/1000 litres) will eliminate most of the sap but for deeply embedded sap hyphae, further surface treatments using a PP paste may be required. The down side of PP, of course, is the inherent danger of using it at all. It is not recommended for those inexperienced with its use. Treating a sap-affected fish requires that the wound site be tended completely. As mentioned, sap is generally a secondary invader; this means something else went wrong to allow the sap to take hold, like a parasite attack or another wound that opened the tissue. So, when treating a sap-affected fish, first eliminate the sap from the surface of the fish and then treat the actual wound site, which is most likely starting to look like an ulcer. For the latter, Tri-Cide Neo, iodine, PP paste and/or Debride topical ointment are good choices. Depending on the extent of the underlying wound, injectable medications may be required and the assistance of a veterinarian sought. If you suspect that cold water has allowed sap to become a primary invader, attention to the surface tissue of the affected fish is still required as the sap hyphae penetrates the tissue and can allow bacteria to enter the wound site. Much has been said regarding the importance of using a microscope in the Koi hobby. A microscope with a range up to 400x (eg 40X objective and 10X eyepiece) is an invaluable tool for diagnosing problems with our fish as well as viewing almost the entire spectrum of the ecology of our ponds from algae to parasites to the larvae of insects. At 200x, the filament structure of sap is easily to see and at 400x, the hyphae and spherical ends of sap are clearly discernible. Also, at 200x the movement of most parasites can be easily seen and at 400x, virtually all of the parasites that routinely inhabit our ponds can be detected and identified. As you can see, sap is one of the major potential problems that we have to be prepared to deal with. Since sap is always present in our ponds, it is imperative to take as many preventative measures as possible to keep it from affecting the fish. But even the best pond keepers will eventually get a sap outbreak and when this happens, treatment must be quick and complete as this is not a problem that will just go away all by itself.